Wa Gwaaan people! My name is Goblin Prince, world famous doctor of Astrology and Academy Award® winning guru of black magic spell removal. I travel the world catching ghosts and removing black magic spells for a living but in my spare time I tell people's fortunes. I personally guarantee all my predictions to be 100% accurate, unlike those money-hungry, filthy, lying whores who write for women's magazines. 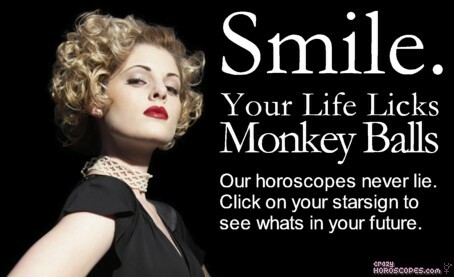 Read your horoscope and prepare to be amazed by my super powers! Or alternatively click here to go to my personal website if you require more information on how I can remove a black magic spell which has been cast on yourself, your loved ones or your dog.